← Voting Is Open for 24 hours!! Actually, if technically you assumed I’m totally and completely addicted and obsessed, you’d be closer to the truth. I like many of the stories I’ve read better than the original work that inspired them. 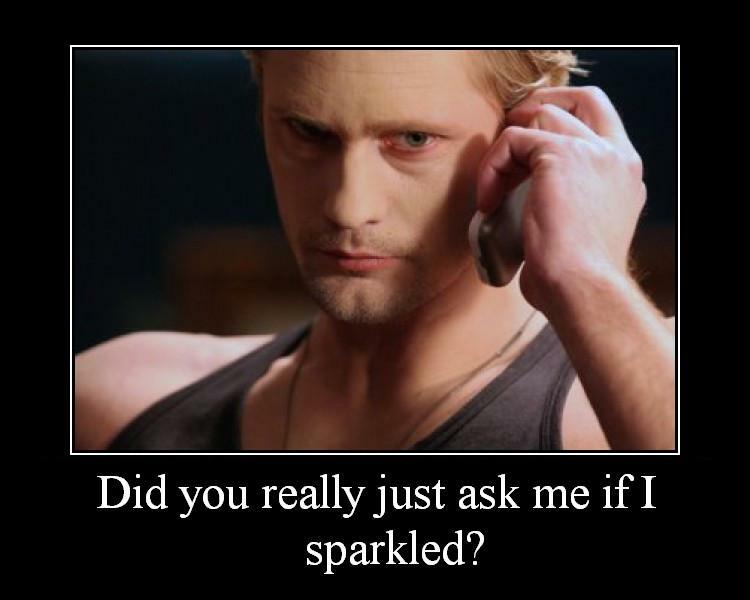 It started with a vampire named Eric Northman, and a little fairy hybrid that made his silent heart flutter. Then the author pulled a shotgun loaded with silver shrapnel from under her petticoats and killed everything she’d set up over the last decade and proceeded to skate around in the bloody guts of my allegiance whilst singing “It’s Raining Men.” (Yeah, SVM fans, you know what I’m talking about. Your guts were there too.) Thirteen years of story… bombed with a wish. Not that CH hadn’t upset me many times before, she had. Masterfully crafted characters were suddenly different from one book to the next, with blatant contradictions to previous books thrown in whenever it suited the new one, but one thing remained constant: Eric Northman was an incredible character. I still can’t decide if it was a fluke, or skill, but the nuances enraptured me. So after After Dead, I was reading reviews on Amazon just to confirm that others were as outraged by the waste of time and money that the series devolved into (I’m not a bitter or angry person, but reading is my favourite and… just, no, Charlaine Harris, no,) when I came across a review with brilliant things to say about the series, and a recommendation for a fan inspired re-work of the series’ end called Dead on the Crossroads, by GoddessD. Now, I’ve had theatre friends reading and loving Twilight and Harry Potter fanfic for years, but since vampires don’t sparkle in the sun (they burn! come on now!) and HP is so sacred a work in my life that I’ve needed to ink its importance into my skin in a permanent way, fanfic was always a step too far in my snobby-literature-needs-a-proper-publisher brain. But. I. Was. WROOOOOONG. Wrong, wrong, wrong, wrong, wrong, and I have zero problem saying it. Reading Dead on the Crossroads changed the game completely. I was hooked. Blown away by the underground talent. It felt like the first time someone played me music by my favourite inde rock band. I couldn’t believe how raw and powerful it could be. Popularity didn’t matter, what mattered were the themes explored. And they could make me think and stay with me for days! Maybe it was a ‘right head-place at the right time’ since my disappointment with CH was bordering outrage and Winds of Winter wouldn’t be out until, well, whenever George RR Martin puts it out, and I’d literally gone through every book I owned at least twice (including the bedside stack of ‘I want to read these because they cost next-to-nothing at the used book shop,’) but after I flew through that first one, I found myself greedily devouring more and more and more, branching into other genres and fandoms until I felt an urge that I tried for many years of late to ignore. I had my own story to tell. Strike that. I had a story to tell about characters that were not my own. First time ever that’s happened to me! Again, I rebelled. I couldn’t write fan fiction! Nooooo. I had at least four other unfinished novels or scripts on my hard drive that had been neglected for years. If I started an EN story, I’d never finish it anyway, so what was the point? And work often saps my creativity with its demands on my muse and the drudgery of nit-picking grammar; history would only repeat itself and why would anyone want to read my writing anyway? I’m no one. I don’t have a body of existing work that others love, nor am I socially active or connected on FF forums. Even if I told my story, no one would care. I just ignored it. I let the plot bunnies use my head as a warren for months until I had to get a little out for closure on the story that had so disappointed me. I needed Sookie to write a letter to Eric. I still don’t know what possessed me to first publish it on Fanfiction.net. I usually stay as private as possible in my day to day. I don’t chat on the phone, I rarely use social media, I don’t go out with work colleagues, I find even writing to others directly very hard, and even in my little village, no one really knows me as anything other than the lady that smiles at everyone but doesn’t talk much. I’ve had the same five besties all my life (though I’ve moved far away and we rarely see each other now) and in the last ten years of singledom, I’ve dated three people. Well, dated sort of. Went on dates with. Only one with regularity and that was over as soon as it got serious more quickly than I was ready for. In other words I’m shy. Introverted in an extreme way. And shy. There’s a difference. And I’m both. So publishing Dead and the Descendant was scary and I’d never have done it if I wasn’t assured my anonymity. WolvesHaveReturned became my safety blanket and quasi-superhero alias. In anonymity, I could be a woman with courage. 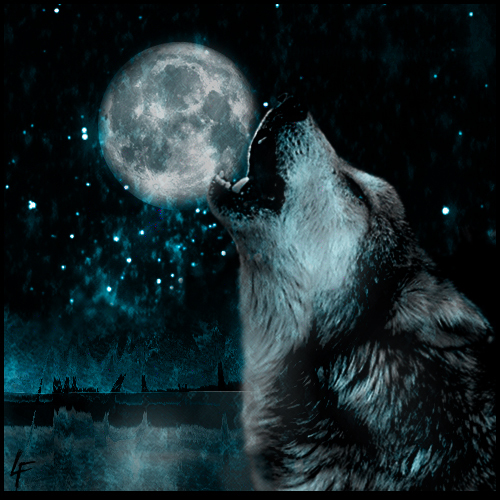 I could be a wolf that howled to the moon and let her voice be heard by members of her fandom pack across the globe. I’d been silent and wandering for years, and you heard me within months of finally finding my voice. Thank you for the bright spot in my life that I had no idea was missing. Thank you to the writers who have given me hours/weeks/months of joy with your work. Thank you to the betas who keep OCD editors from going barmy with typo obsessions or grammatical misguidance, and the support and encouragement they give to their authors that keeps them giving us new stories to read. Thank you to the readers, whether silent-ne’er-reviewers, encouraging, outspoken, skeptical, or gushing, genius demands audience in any medium and the more you read, the more I can read too. 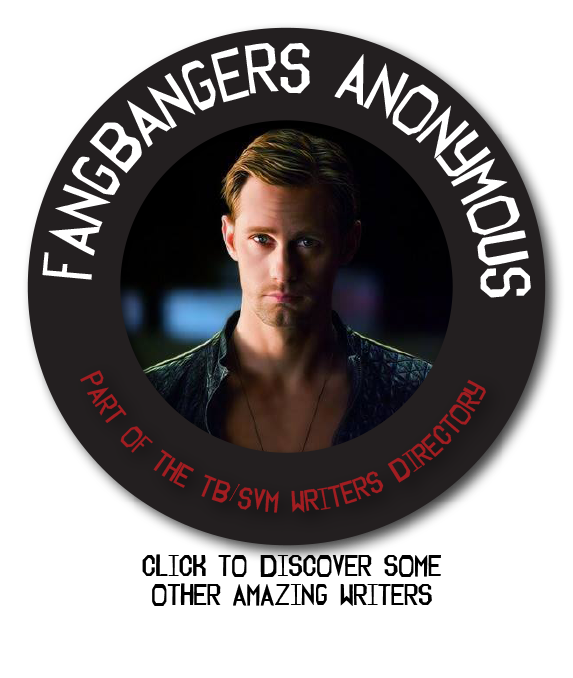 Thank you to the fandom devotees that take time out of their lives to moderate, compile, build, and direct websites that allow us direct access to fics, pics, memes, humor, forums, each other, and all manner of media. I’m so grateful for what you’ve all brought into my life. I’ll keep howling if you will. Boy, did you take the words out of my mouth or what AND in a more elegant manner than I could ever had? 🙂 I too am extra secluded and just like you I’m very shy (well in my case probably it leans toward insecurity, but I’m sure you get the drift). So here I am to tell you that you are not alone in your journey to try and change your ways. A week ago I would have read your post, but never comment only click the ‘like’ button and had it been two weeks ago I wouldn’t even have done that 😦 Because why would you care what I think? Anywho, keep up the good work!! We can take baby steps together to make it easier! ps.ps. Please don’t hold my typos or poor grammar against me, I promise I’m not a bad person. Oh, gaaad! I promise I’m not a grammar nazi! Well… maybe a little, but rest assured, you’ve given me no cause to cringe! It’s funny, I think SVM has an audience that is very conscientious when it comes to language in general! I’m regularly impressed with our authors’ abilities! My other major fandom… weeeelll… maybe it’s just a younger crowd? And the irony is that it’s Doctor Who. Sookie and Co. are from the Boonies and she self-educated on genre novels. The Doctor is an alien super-genius and SVM tends to be better-written. Anyway, I love the way you write. I can’t tell you that enough! Don’t let the Viking bully you too much! Or do, actually, because it’s working, lol! Lol! I love it!! That’s awesome!! I should let her know what she started for me! It’s seriously my vice now and I couldn’t be happier about it! Okay, I’m inspired and feeling a bit courageous, so I’m going to follow your example and let my all time fav’s know how they’ve inspired me! Thank you again for all that you’re doing for the fandom. personally started reading ff after Dead Reckoning of the SVM.I knew that CH wasn’t giving us a HEA for favorite couple . I don’t think this fandom is dying, I think many of the readers are shy so they don’t leave reviews or in the case of YWBA they forgot to nominate their favorite stories and wriyers. Oh, I wholeheartedly agree! One of the beautiful things about FF is the commitment writers make to telling their stories in spite of commitments and obligations on their time and energies. They aren’t getting any compensation so the reward is really in the doing of the thing and the sharing. It’s special. It connects us through mutual interest and gives us a window into the way others approach life. Your support through readership is invaluable! I’m sure most authors would agree with me that they’d take that any day over all the votes and nominations in the world, and just the fact that you have kids and a life you juggle every day and you still take the time to leave feedback and support means everything. And, oh, I understand! My sons are a little older now which frees up my time considerably, but I still can’t go into the toilet and shut the door without someone wanting my attention. Thank you for being you and doing what you do. Raising kids is hard full stop, but it really is wonderful to know that good thoughtful people are teaching leading by example to the next generations. Is that a weird thing to say? I don’t know. I just know I like knowing nice people have kids.